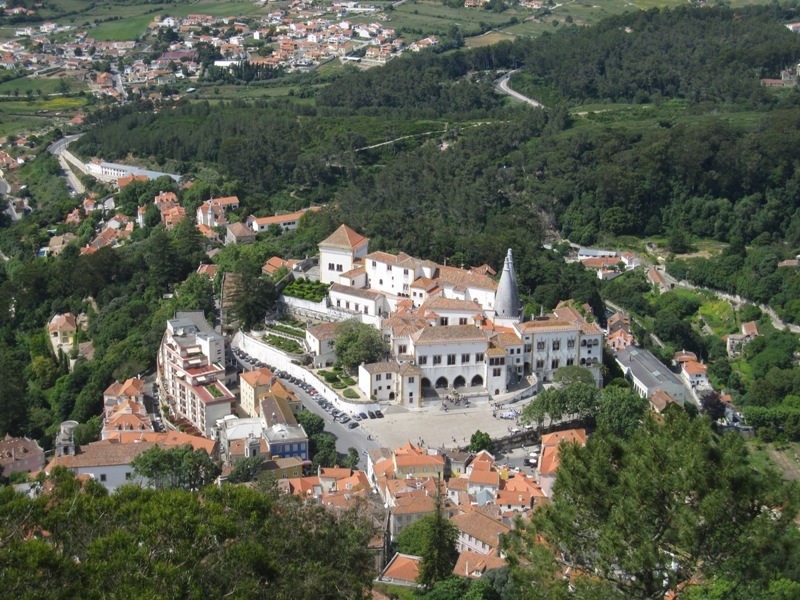 We have twice been to Sintra, a city west of Lisbon on the edge of the Sintra-Cascais Natural Park. The first time was in May 2011, when we took a train from Lisbon’s Rossio Station, a trip of some 45 minutes. The second time was in August 2015. This time, we went by car. This second trip was in all respects a completely different experience. 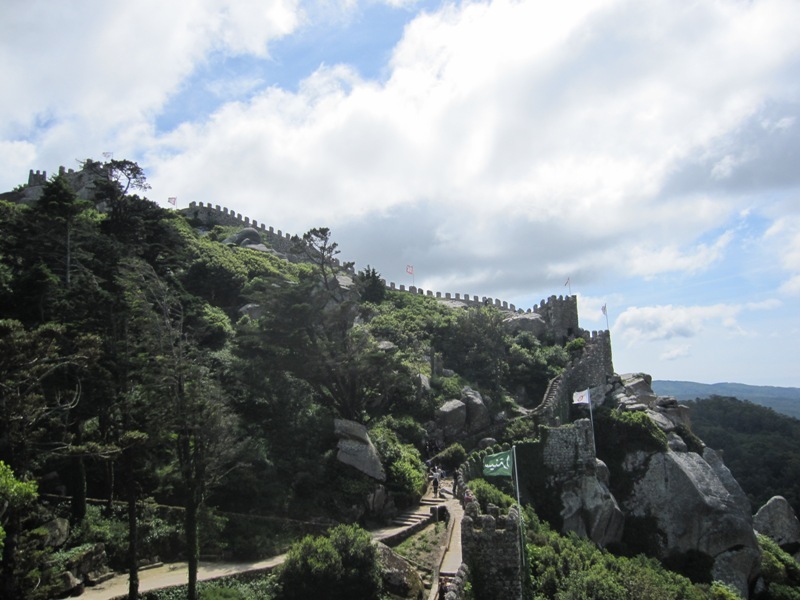 In May 2011, our main destination was the eighth or ninth century Castelo dos Mouros, the Castle of the Moors. It was taken from the Moors by Portuguese forces after King Afonso Henriques captured Lisbon in 1147. Later kings, such as Sancho I (1185-1212) and Fernando I (1367-1383), rebuilt and strengthened the castle, but its strategic importance in the Reconquista grew ever smaller as the war against the Moors came to a close. The castle was abandoned during the reign of King Manuel I (1495-1521). In 1755, the castle, already in a ruinous state, was further damaged by the notorious earthquake of that year. It was not until 1840 that attempts were made to save parts of this once proud stronghold. Ferdinand, a German prince from the House of Saxe-Coburg-Gotha and husband to Queen Maria II of Portugal, ordered his compatriot Baron Von Eschwege to improve the state of the castle. The result is a set of renovated ruins located at the top of a hill in the Sintra Mountains, with a splendid view. It draws many tourists every year. When we visited the castle in 2011, we walked from the railway station on the edge of the old town to the centre. If you follow the road, you will pass a Neo-Moorish fountain (Fonte Mourisca) and subsequently arrive at the Palácio Nacional de Sintra, which is immediately recognisable because of its impressive white chimneys. We had lunch at a lovely restaurant called Tulhas and then began climbing the hill to get to the castle. Bus services should be available for those of you who do not want to walk, but I really recommend walking. You should be able to see the cottage where Danish author of fairy tales Hans Christian Andersen stayed in 1866. You can find it near the medieval Igreja de Santa Maria. Palácio Nacional de Sintra, seen from above. Although improved and reconstructed, the castle is still a ruin, so do not expect to find much art and architecture here. It is a wonderful experience to walk on the castle walls, go up and down and admire the panoramic view. On a sunny day, you should be able to see the sea. You will certainly be able to see the nineteenth century Romanticist Palácio da Pena on a hill to the south of the castle. 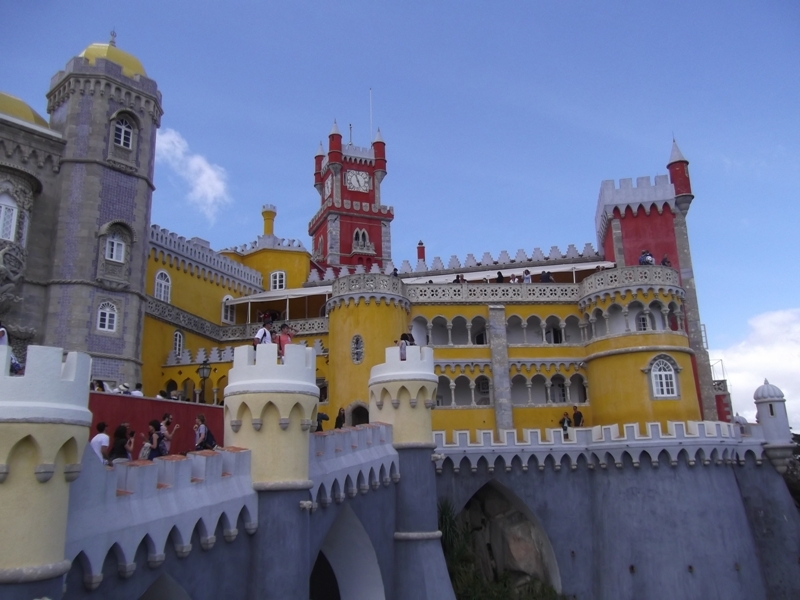 The Palácio da Pena looked intriguing, a pink and yellow Disney palace from a fantasy realm. Although it certainly does not qualify as ‘beautiful’, it was the main reason I wanted to return to Sintra four years later. In August 2015, we stayed in the small village of Vila Nova, which is about an hour’s drive north of Lisbon. On one of the last days of our vacation, we took our car and went south to Sintra. The first part of the trip was easy. Portugal’s toll roads are in excellent condition and we rapidly approached Sintra, where traffic soon became a lot more dense. Sintra’s historical centre’s infrastructure has never been modernised and is completely inadequate for handling lots of modern-day traffic. This was not a problem on our first trip in 2011, as we went by train and it was not the peak season anyway. Things were dramatically different in August 2015. We soon got stuck in traffic and the congestion was so bad, it took us more than an hour to reach the palace. We had a bus filled with tourists on our tail for most of the way, and succeeded in securing one of the last free spots in the car park. On the way up, some ladies managed to rescue a duck, which had decided to cross the road in heavy traffic. Fountain of the Small Birds. We bought our ticket at the Gatekeeper’s House, which is a secondary entrance. From there, we had to walk about one more kilometre uphill, as it is not possible to reach the palace itself by car. A tourist who complained to a guard about having to walk got the perfect answer: “This is a castle on a rock, Sir, what did you expect?” Having to walk uphill was actually quite nice, since we had been in the car for over two hours. It is not a steep climb, and Pena Park, in which the palace is located, is wonderful. 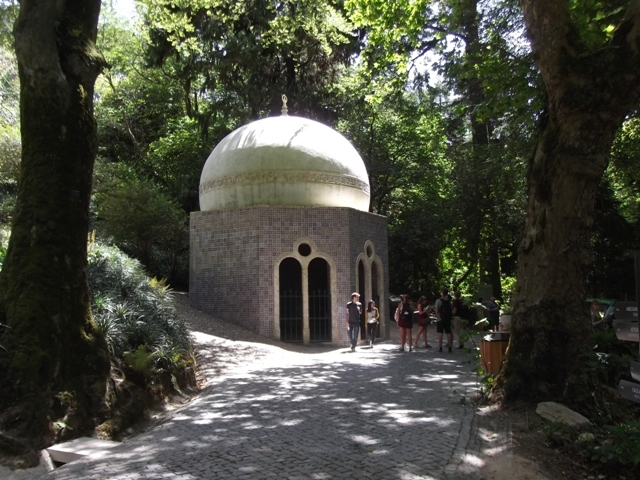 The paths are well-kept, and the visitor will encounter interesting objects along the way, such as a pavilion with a large spherical dome in Neo-Arabic style. It is called the Fountain of the Small Birds. Expect to see exotic vegetation, duck houses, small chapels and a water wheel as well. If you have all day, you can wander around for hours and see the Cruz Alta, a carved stone cross at the highest point in the mountains. 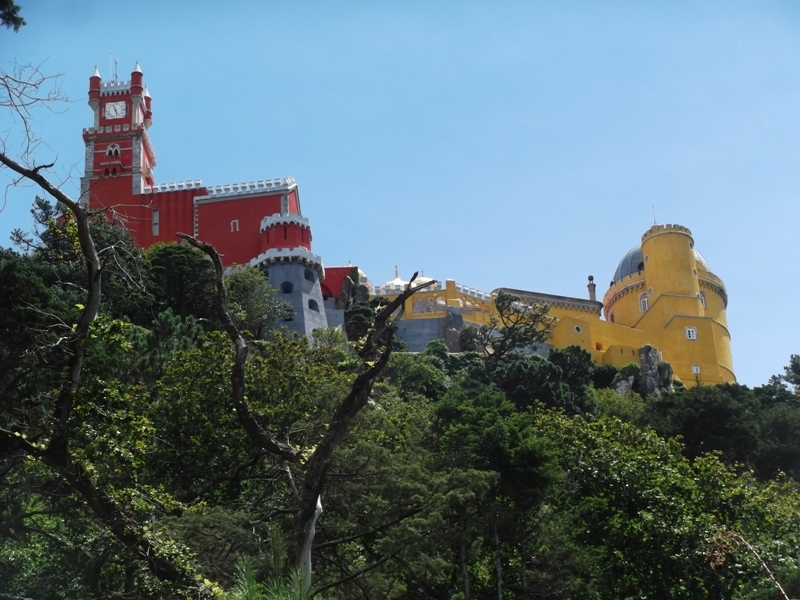 The palace is built on a site in the Sintra Mountains where a chapel dedicated to Nossa Senhora da Pena (Our Lady of Pena) has existed since the Middle Ages (12th century). 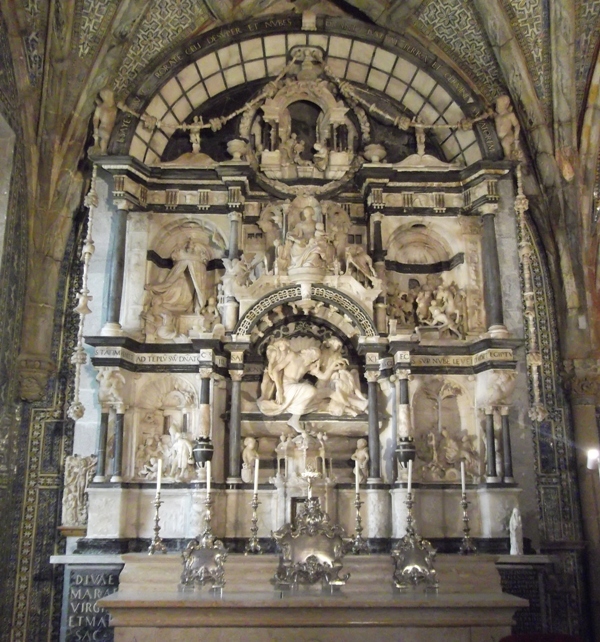 King Manuel I, already mentioned above, added a monastery for the Order of Saint Jerome to the chapel in 1503. This was some two years after the king had started construction of the famous Jerónimos Monastery in Belém, Lisbon, which was run by the Order of Saint Jerome as well. The monastery in Sintra was virtually destroyed in the 1755 earthquake, although the chapel and much of the artwork inside survived. Ferdinand II, the German prince and King Consort mentioned above, bought the old monastery in 1838 and decided to turn it into a summer residence for the Portuguese royal family. In summer, it can easily get extremely hot in Lisbon, and one can understand why the royals would have wanted to relocate to the Sintra Mountains in that season: it is nice and cool up here, at times even a bit chilly. Ferdinand entrusted the task of building the palace to Von Eschwege, the man who also improved the Castelo dos Mouros. Construction started in 1842 and was completed in 1854. It was a modern building in all respects, being one of the first buildings with running water, flushing toilets and telegraph facilities. 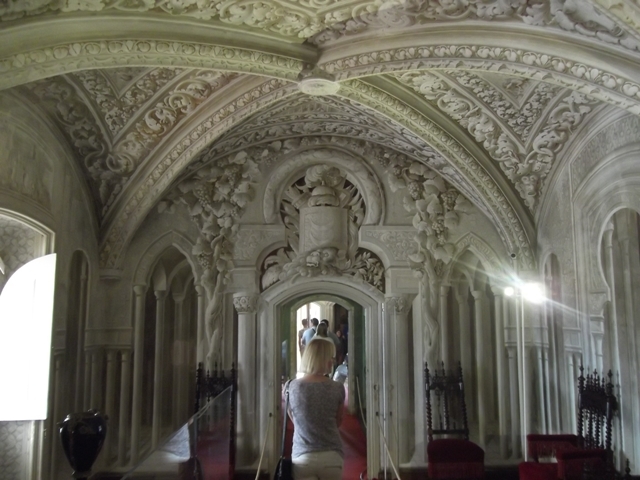 At the same time, the palace’s architect employed several older styles, so the Palácio da Pena has Neo-Arabic, Neo-Manueline and several other Neo-ish elements. With some justification, Ferdinand became known as the Artist-King. However, he was not king in his own right, only by right of his wife. When Queen Maria II of Portugal died in 1853, the throne passed to their son Pedro, who ruled as Pedro V (1853-1861). Ferdinand married again in 1869, this time to the Countess of Edla, a Swiss-American singer and actress. The former king left the Palácio da Pena to her in his will, but just four years after his death in 1885, the palace and park were acquired by the State. After the monarchy was abolished in 1910, the Palácio da Pena became a museum. A lot of people were visiting the castle this day in August, so after inspecting some of the walls and towers outside, we queued up and waited until it was our turn to go inside. We first visited the northern part of the palace, which is the part that is painted strawberry pink. It looked like the building had been given a fresh lick of paint, and the whole site seemed to be in a much better condition than in 2011, when we admired the palace from the Castelo dos Mouros some 500 metres further to the north. 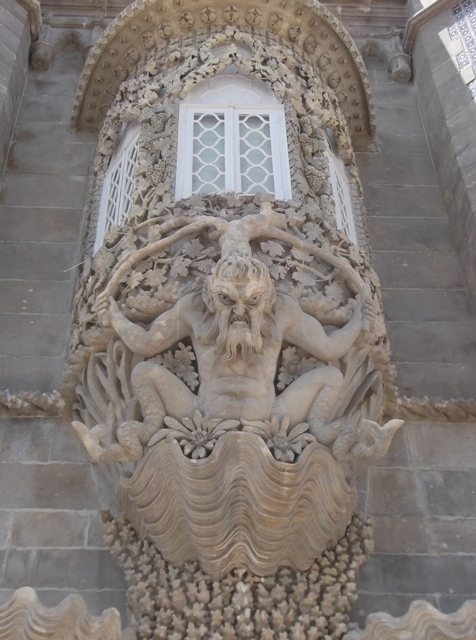 One of the highlights you see before you enter the palace itself, is the Triton Gateway, with a Triton – half-man, half-sea creature – symbolising creation above a Manueline style entrance. 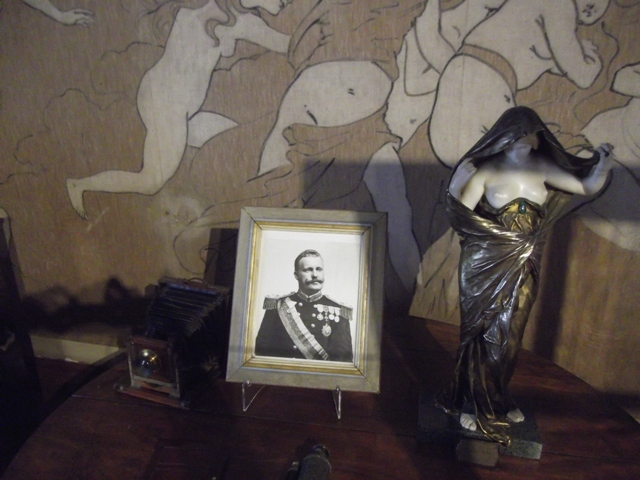 King Carlos I; behind him some of his “work”. Once inside, we first saw a bust of the man who started it all, Ferdinand of Saxe-Coburg-Gotha. We then proceeded to the dining room (Sala de Jantar) and were allowed to take a look inside King Carlos I’s atelier. Carlos was King of Portugal from 1889 until 1908, when he was murdered in Lisbon by members of a revolutionary organisation. The king was a patron of the arts and liked to paint himself as well. Apparently he especially enjoyed painting scantily clad ladies. The palace has an interesting collection of paintings. I spotted a few by less famous Dutch Golden Age painters such as Aert van der Neer (1603-1677) and Adriaen van de Venne (1589-1662). The northern part of the palace is where the monastery used to be, and the sixteenth century cloister was incorporated into the new building. Some of the original decorations can still be seen in the niches. We continued our tour through the palace and saw several bedrooms, the bathroom and the wonderful Sala Arabe, with beautiful trompe-l’oeil decorations. Another definite highlight is the Queen’s Terrace. It offers a panoramic view of the surrounding area and on a clear day one can easily identify some of the more defining structures in Lisbon, such as the Cristo Rei – a large statue of Christ the Redeemer – near the Ponte 25 de Abril. The southern part of the palace, painted in the colours of a daffodil, has a few interesting rooms as well. Here, the visitor can find King Manuel II’s bedroom, the room of Portugal’s last king, dethroned in the 1910 revolution which turned Portugal into a republic. The spacious hall is also worth a visit, with its lavish interior. The large kitchen looks like it could be used again any time. Do not forget to visit the chapel, which has a separate entrance. This is where the complex started in the twelfth century. The chapel survived the 1755 earthquake unscathed, and all of the treasures inside were spared. The most prized possession is an elaborate sixteenth century retable or altarpiece. It was made by French sculptor Nicolau Chanterene (1485-1551), who is also known for his work in the Igreja de Santa Maria in Óbidos. The impressive alabaster and marble retable has several niches, which show scenes from the life of Christ, from birth to ascension. All in all, we thoroughly enjoyed our second trip to Sintra and we will surely return one day to see the Palácio Nacional de Sintra.